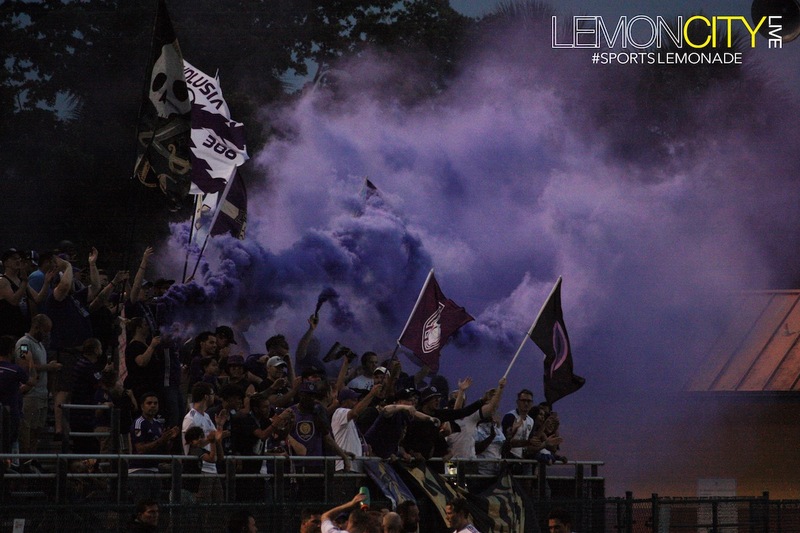 Hialeah, FL – This time last year we were one week away from Orlando City SC‘s untimely exit from the U.S. Open Cup at the hands of a then, on fire, Miami FC. Stefano Pinho was the hero back then, scoring a hat trick against his future club, eliminating the Lions from the Open Cup. This time around, he’s rocking the purp, but he’s still scoring goals. In his return to Miami, playing against Miami United FC, Pinho would once again score the decisive goal, but this time, instead of eliminating Orlando, he’d help them advance. In the 37th minute, Pinho would find a cross inside the box from RJ Allen, on a play initiated by former USMNT player, Sacha Kljestan, and the Brazilian did what he does best, score! Pinho had plenty of opportunities, and with the Lions controlling the ball, mostly deep in Miami’s territory, it was only a matter of time. Side note, I was watching the goalscoring play unfold next to Miami FC’s play-by-play commentator, Bruce Silverman, as he pretty much described, in perfect detail, everything that was about to happen, before it happened, right up to the ball hitting the back of the net. It was like listening to the future! In the 53rd minute, Kljestan fed Dillon Powers at the top of the penalty area, and he earned his first kill for the pack as a Lion, taking the soul of United goalkeeper, Occenat Peterson. 2-0. Kljestan must be Serbian for assist, because Sacha put up a maestro (assist hat-trick). In the 62nd minute, he intercepted a ball inside Miami’s territory, and before you could yell “Return of the Mac“, he corrected you and served up some PC, extending the lead to 3-0! You might remember that both Pinho and PC played together for the Fort Lauderdale Strikers in 2015. The very next season (2016), PC scored a game-winning goal in the 120th minute to help the Strikers advance into the quarterfinals, eliminating Orlando. The Lions signed him for the next season. Afterwards, in 2017, as I mentioned above, Pinho helped history repeat itself, and was also later signed to Orlando. If you can’t beat ’em, sign ’em! Both of those matches took place in Orlando, so it only makes sense that Orlando would travel to South Florida to earn its revenge, sort of. On to the Round of 16! Stay tuned to Lemon City Live for the draw to see who they’ll play next in their Open Cup Hunt for Lamar!